There's no point to drowning in PDF features you don't want (and really, really don't want to pay for) when you can stock your toolbox with exactly what you require. These five freebies push the boundaries of what you can do with a PDF file. 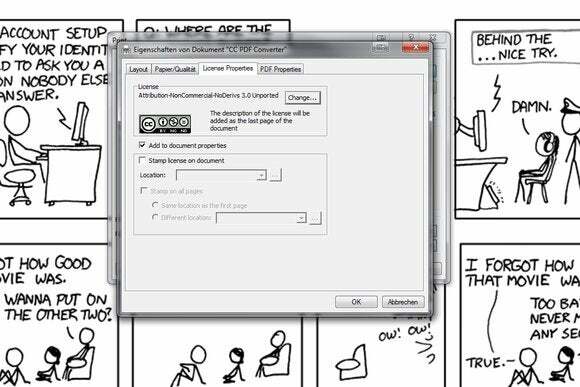 Whether you long to edit, watermark, or otherwise tweak your PDF; add a Creative Commons license, or just cut your PDF down to size, one of these can make your PDFs what you want them to be...for free. This portable app's website says "Bright Snippet Sire," but everybody calls it Briss. An open-source favorite, Briss crops a section of a PDF file and creates another PDF file of the cropped area. It's easy to use, and it's awfully handy. Snipping out unwanted areas of a PDF—then saving to a new PDF—is Briss's specialty. E-bookworms with e-readers have a particular need for Briss. To read a PDF on an e-reader, you normally have to format and convert it, and traditional ebook converters (such as ePub converters) frequently make a hash of PDF conversion. Briss converts two-column pages into single-column pages, cuts out the unnecessary margins, and automatically removes unwanted fluff, such as page numbers and chapter headings. 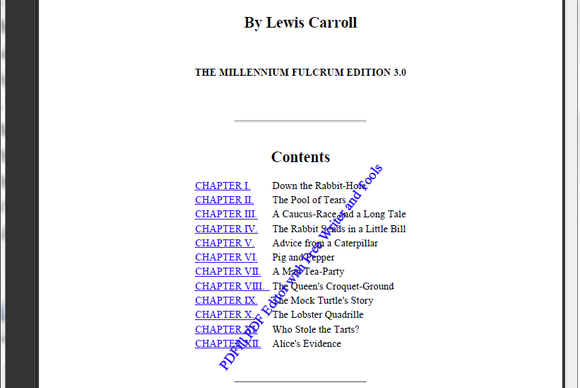 You can successfully pass the resulting clean PDF through an ePub converter. With Creative Commons licenses, you can distribute your creative work for free and specify the conditions under which it can be used. For example, you can offer your work free for use, provided you receive attribution. Or you can say that it's fine for personal or nonprofit projects to use your work, but that commercial ventures have to pay you. Attaching one of these licenses to the work removes any ambiguity or doubt as to the terms and conditions under which you share your work. CC PDF Converter helps you find the best Creative Commons license for your creative work (in this case, "you" means Randall Munroe nd "your work" is the webcomic XKCD). CC PDF Converter converts your Word document, Excel file, or Internet Explorer HTML file into a PDF doc...but it's no ordinary PDF. This free, open-source beta program asks you a series of questions about the type of license you want, then stamps a small but legible Creative Commons license on the pages. Open-source developer Michael Schierl describes his jPDF Tweak as the "Swiss Army Knife for PDF Files," and it certainly lives up to that promise. With it, you can add watermarks, change the metadata, combine PDF files, encrypt files, make printable booklets, rotate pages, and more. I love this program so much that it has a permanent place on my PC (and there are Linux editions, too). jPDF Tweak gives you a great deal of control over your images, and it's free and open source. This Java-based portable app makes a nice addition to the road warrior's USB drive or Dropbox folder. Simply double-click the BAT file to run it. Then load the PDF file from your PC in the "input tab" and choose the next tab you need. When you've made changes, go to the "output" tab to generate your tweaked PDF. Bear in mind, though, that if a PDF has existing restrictions protected by a password, that password will hold. jPDF Tweak does not allow you to remove or break the password. PDFill is similar to jPDF Tweak, but with a nicer user interface. As well as the usual features, PDFill includes other goodies, such as file conversion and adding headers and footers. The only downside is that it costs $20 to work watermark-free. If you don't mind a watermark on your saved files, then don't worry about this nag screen. In a default installation, a PDF button appears inside Microsoft Word, Excel, and Powerpoint to start PDFill directly. You can also insert the same button into the Internet Explorer browser, and into the Quick Launch and SendTo functions of Windows.These integration options are voluntary and easy to de-select at installation. 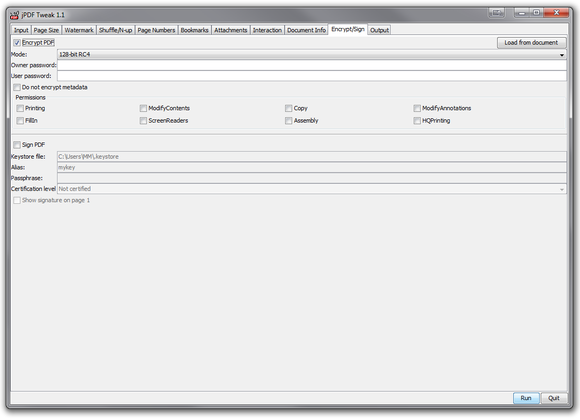 PDFill consists of Editor, Writer, and Tools. 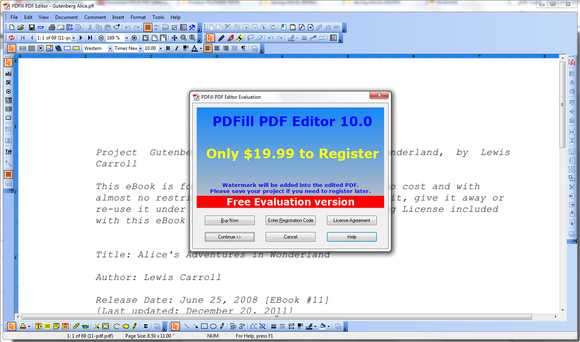 Editor, whose interface resembles Microsoft Word 2003, is the paid $20 version of PDFill. If you decide not to pay, Editor remains fully functional, but it pops up a nag screen upon saving and stamps a watermark on files. PDFill Editor provides a variety of pro-level functions such as creating form fields; writing, drawing, or highlighting pages in a PDF; and exporting and importing form data; as well as the usual PDF file management tools, such as converting, cropping, and rotating. 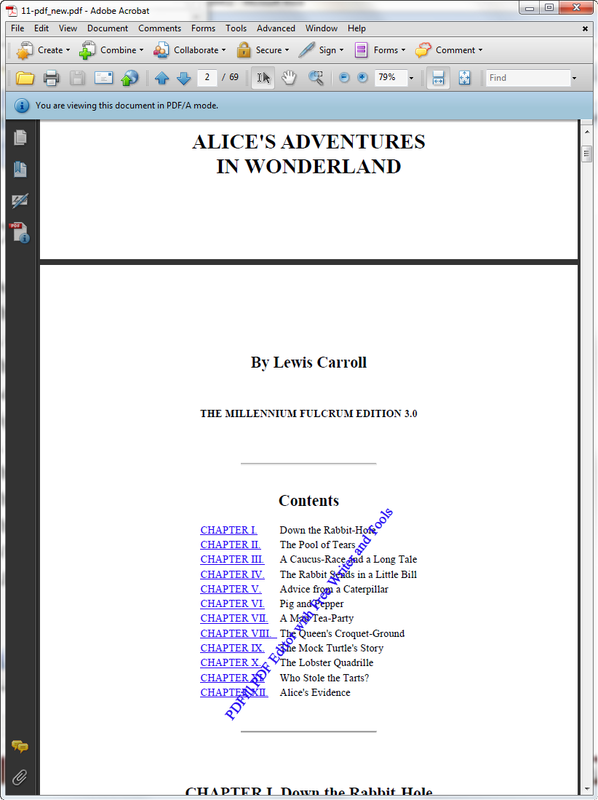 PDFill Writer creates PDF files by attaching itself to your PC printer function. When you want to create a PDF, open your printer dialog box and choose the PDFill Writer as your printer. The watermark an unregistered copy of PDFill Editor adds to saved files can be distracting. PDFill Tools provides even more editing tools, some of which overlap with the paid Editor. This includes merging, splitting, watermarks, rotating, cropping and much more. PDFill packs a punch when it comes to PDF editing functions, and the free version is fine for anyone who doesn't mind nag screens and watermarks. That said, the $20 full version is a really good deal, considering the features that you get. For sheer handiness, it's hard to beat Debenu PDF Tools. It integrates into your Explorer right-click menu, so it's easy to go to town with the PDF editing. 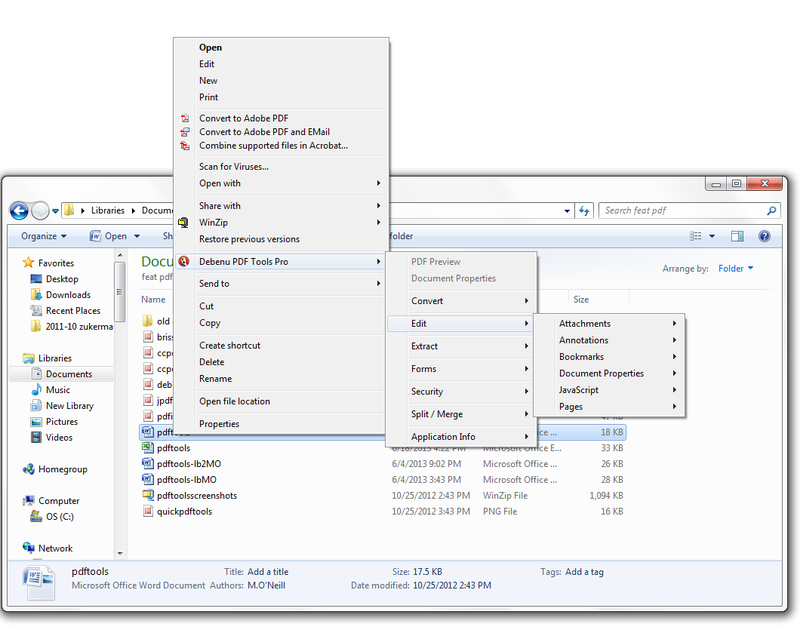 Debenu PDF Tools puts an array of PDF functions in the right-click menu of File/Windows Explorer. Right-clicking and scrolling down the Debenu menu reveals features such as converting a PDF to an image (and vice versa), combining multiple images into one PDF file instantly, converting a PDF to text, adding and removing passwords, removing all bookmarks or extracting them to a text file, adding or editing metadata, and much more. Any functions that won't work on the selected file are grayed out. With the PDF Preview function, you can quickly open the file to get a sneak peek, which is nice if you don't have a PDF reader installed. The Debenu PDF Tools menu has a good selection of features even in the free edition, but many more are available in the $59 Pro edition. Pro includes many more editing features such as adding, editing, extracting, splitting, and removing text and images; removing annotations; and applying digital signatures. Make PDF stand for "pretty darn flexible"
When you think of PDF, don't think of it as a restricted, locked-down file format manageable only with big-ticket Acrobat or still-pricey imitators. These five tools show you that whether you need a Creative Commons license, a PDF book converter, or a wide array of editing tools built into your Windows PC, you can have impressive PDF features for a fraction of the cost…or even for free. 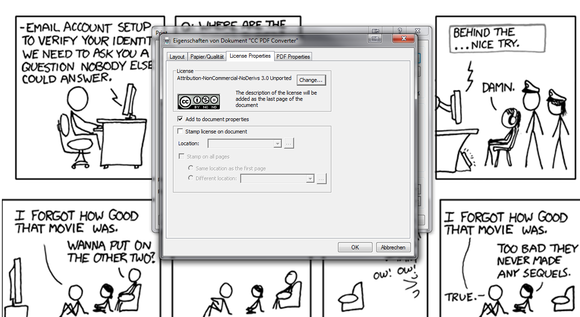 Create PDF documents from almost any application and then attach a Creative Commons license. This Java-based application provides a variety of PDF functions such as combine, encrypt, rotate, split, and watermark. PDFill provides a variety of options for PDF files, including encrypt, merge, and split. Access a selection of useful PDF tools via the Windows Explorer right-click menu. 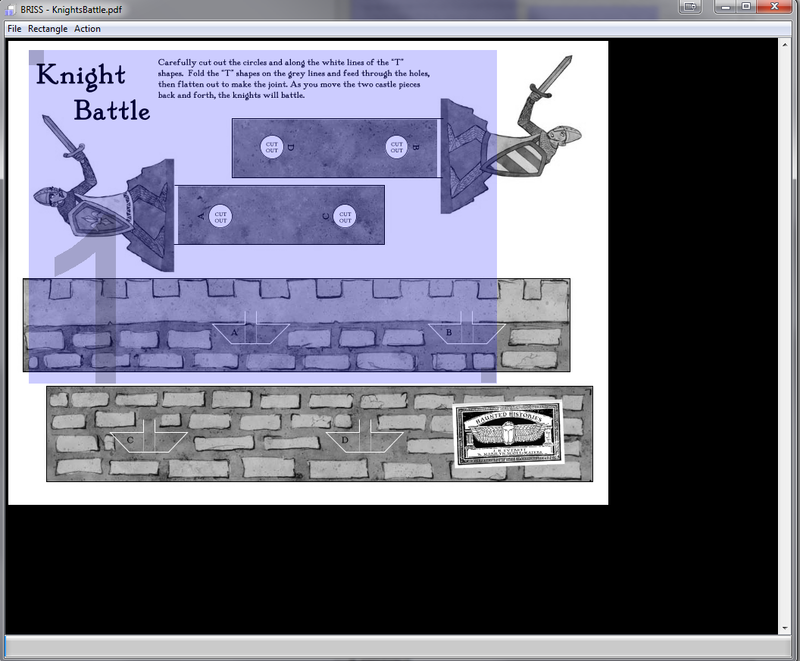 Briss is a good program to trim and crop PDF files so they fit better on your e-reader and are easier to read.